We developed these step adapters to make building stepped exhaust systems simple. Sure, you can beat the larger tube down to meet the smaller tube and weld/grind it until is looks reasonable. 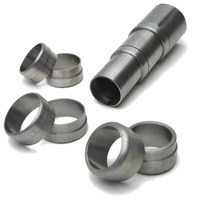 Or just use these adapters and be assured of a perfect result and a super strong joint. These are available in three different sizes. To use these, slip the smaller tube through the adapter until the flush with the end. Edge weld this. Now slip the larger tube onto the adapter and weld it. Since the exposed weld is on a flat area it’s easy to smooth out. For chrome exhausts we go one more step and high-strength silver braze the area where the outside of the adapter meets the smaller tube. This item measures approximately 2.5" wide X 2.5" deep X 2.5" high.